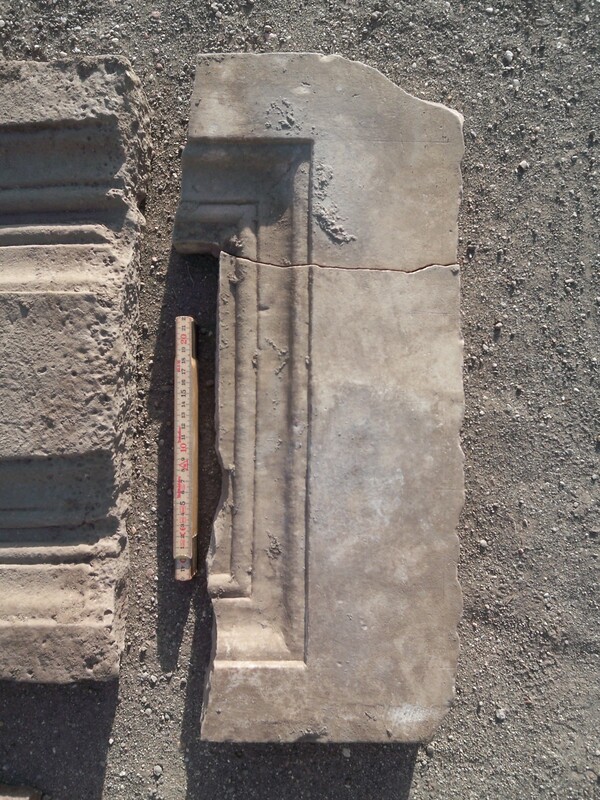 During our excavation of the late-antique surface-layers and contexts since 2010, large amounts of reused architectural elements (spolia) appeared in all Forum porticoes (see pictures below) as in the Foro della Statua Eroica (FSE), which was excavated by our team in cooperation with the Kent University in 2008-2010 (compare section “Berlin Team in KBO 2008-2011“). Most of the material was found in situ in the late antique pavements, while a minor part consisted of ‘left-overs’ from the old excavations until the 1930’ies. 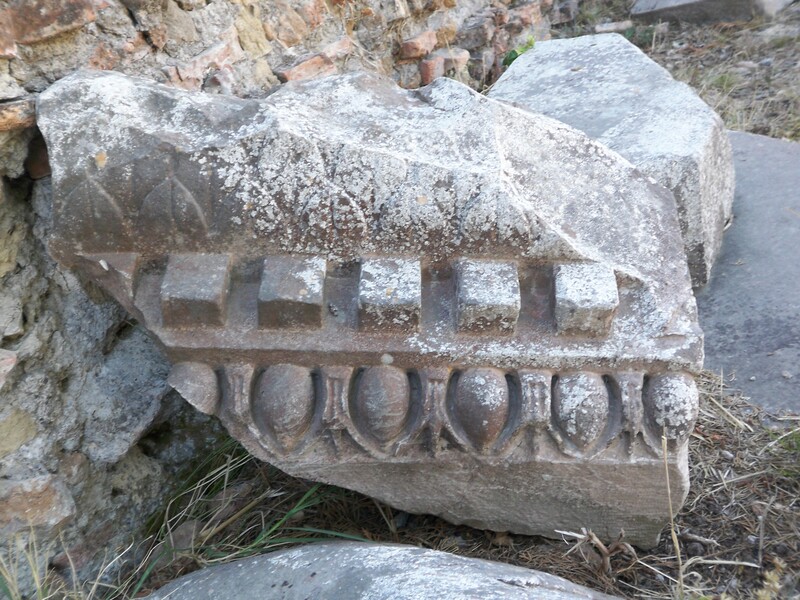 It is interesting that we actually only found a few examples of large architectural elements, which were newly made in Late Antiquity. 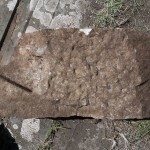 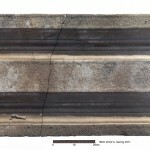 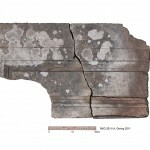 In this section the different kinds of material, which our team has documented so far, will be presented regarding different aspects of use and later reuse(s), but a specific category of spolia, the marble roof tiles, will be presented in a separate section (see “Ostian Marble Roof tiles: a typology“). 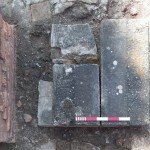 Large finds consisted mostly of marble. 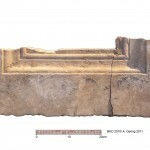 All architectural elements, which showed even minimal characteristic traces of their primary use or later reuse, were treated as finds. 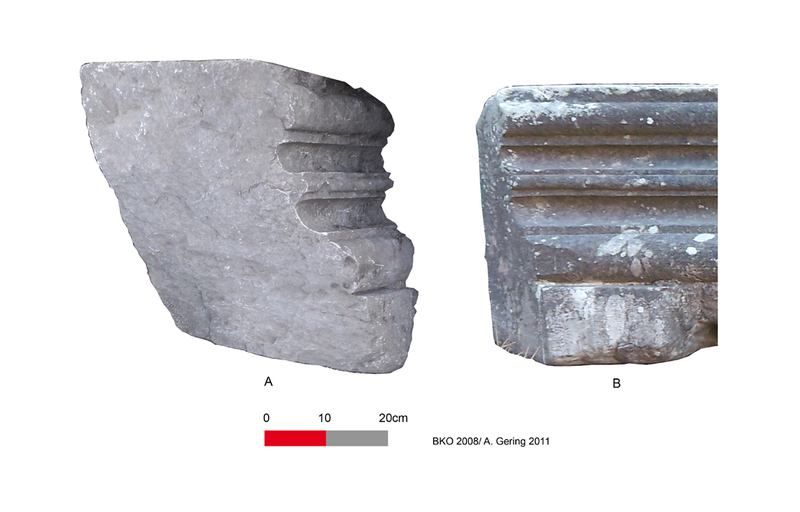 These elements were measured, drawn and recorded 3-dimensionally in their find-context. 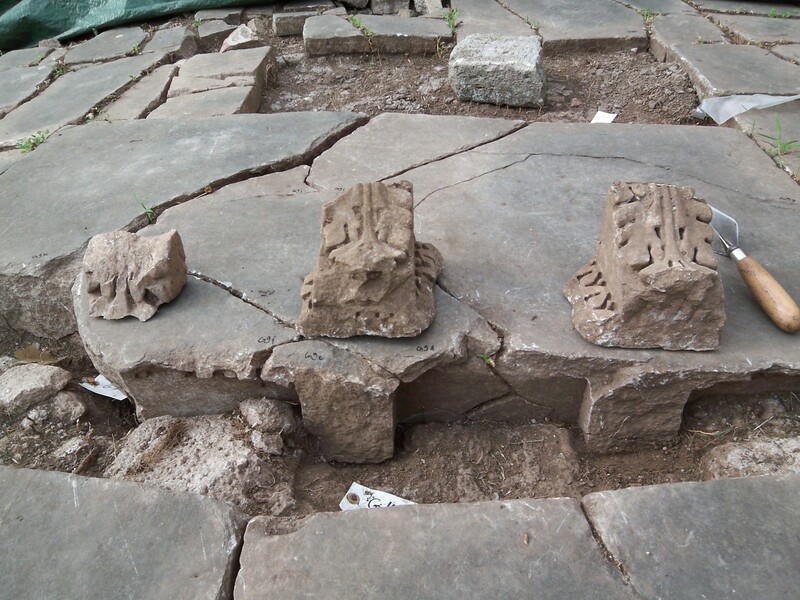 Some architectural elements from our excavations were to a certain degree unfinished. 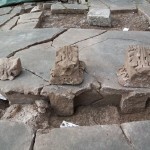 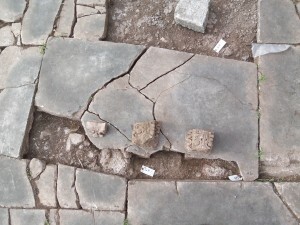 These unfinsihed architectural elements were reused in the later pavements, and still contain characteristic features of their first working process (see example below left). 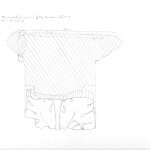 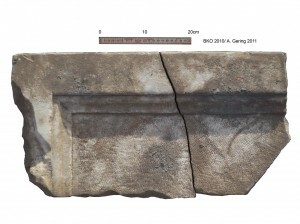 However, most architectural elements found so far were completed for their original context or primary use. 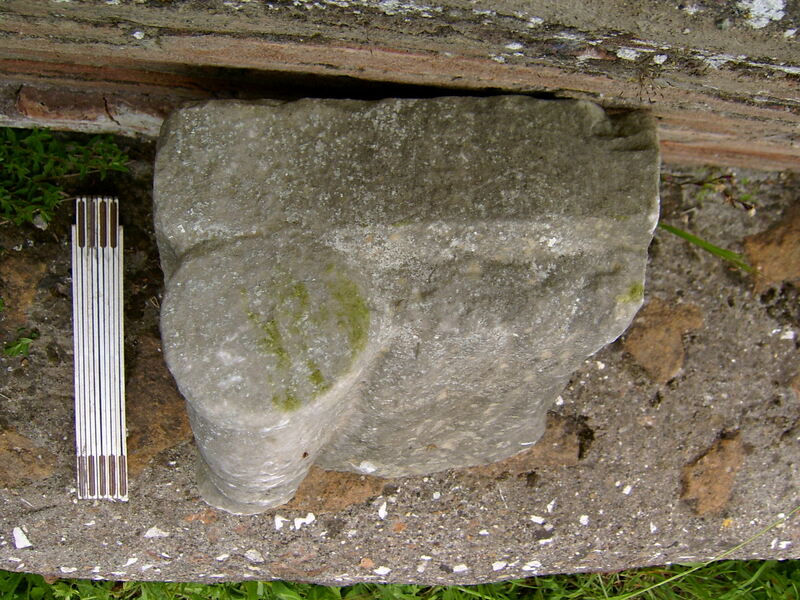 A minor part of these elements was reused in a secondary context without further change (see example of a cella-block below middle, the phenomenon is known as “lateral cycling”, see Schiffer 1972). 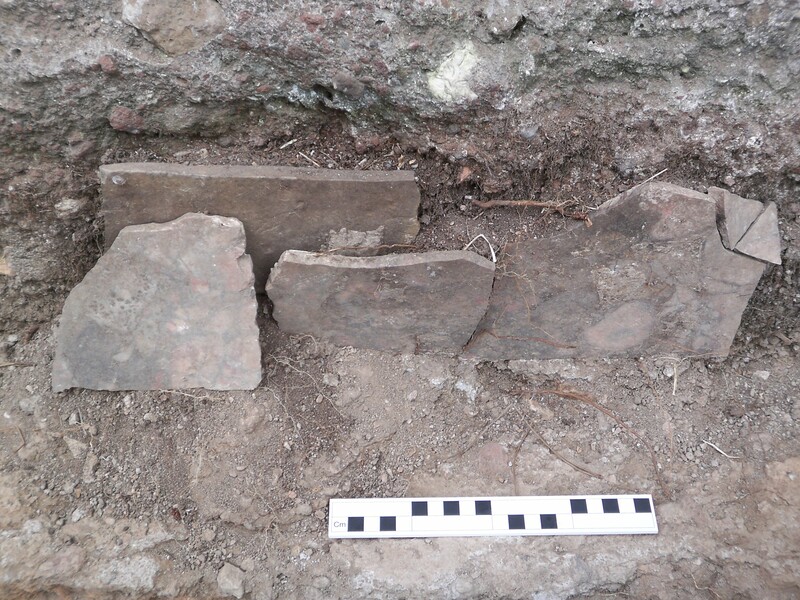 A third category, the major part of our finds so far, shows traces of a secondary use as the stone-block in the picture below to the right, which was cut into pavement-slabs. 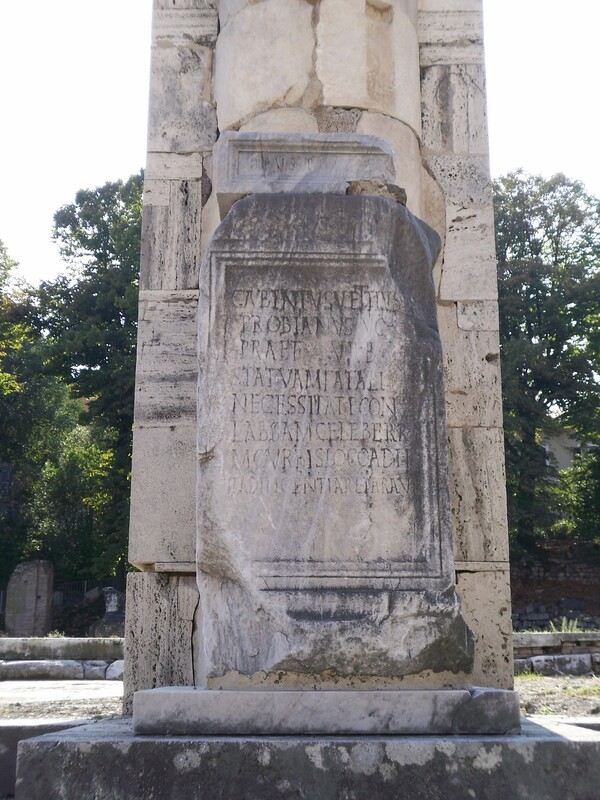 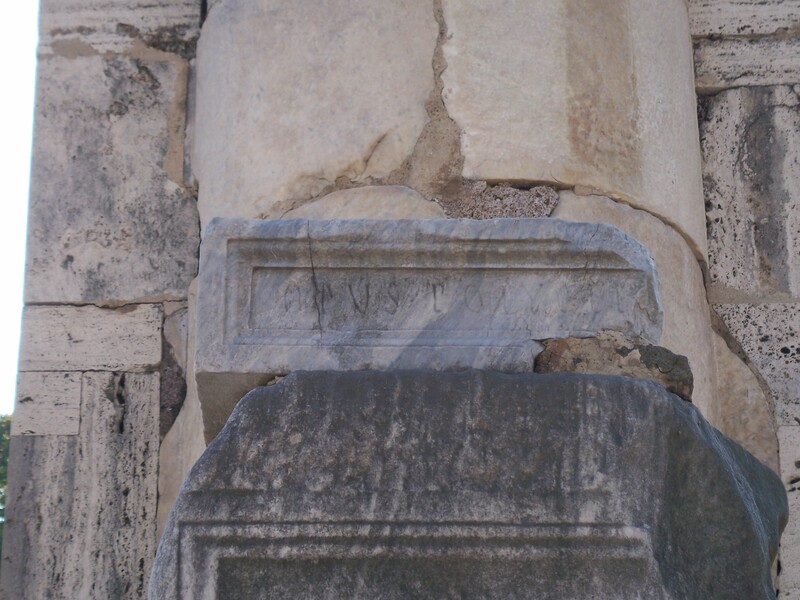 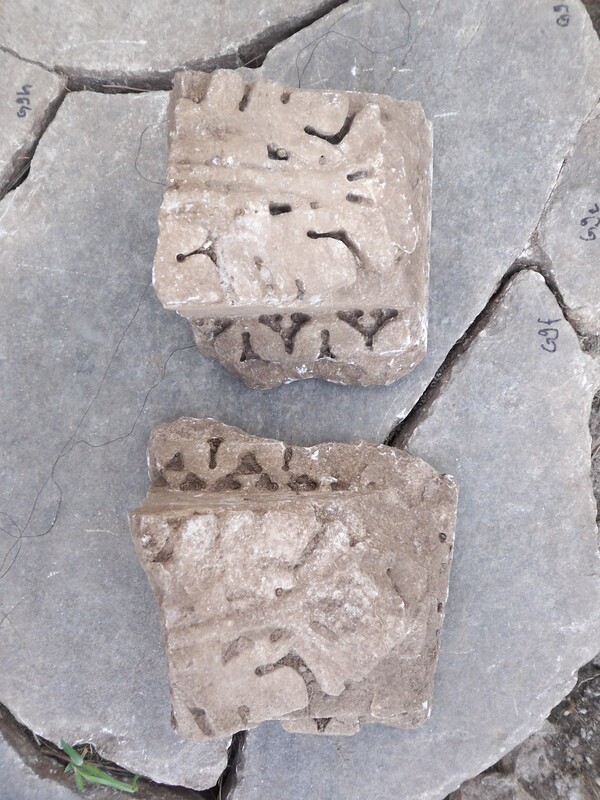 A few of these elements, mostly columns or capitals, still show quarry marks or single letters referring to the original or latest owner, but most of the material has no traces of inscriptions or signs. As an exception, one architectural element was left unfinished in its last stage before polishing, and therefore it showed detailed drawings of its proportioning and composition (see chisel-lines on the picture in the second row below). 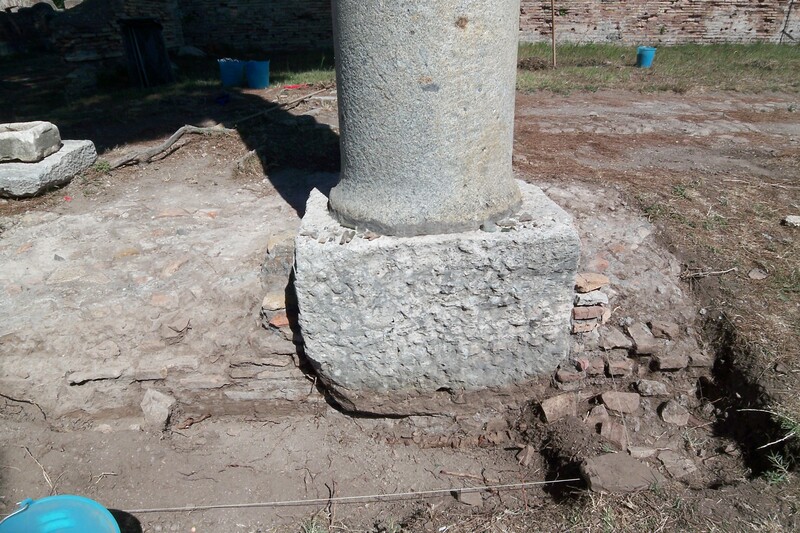 The phenomenon of spolia-use cannot be dated absolutely. 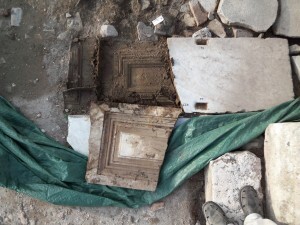 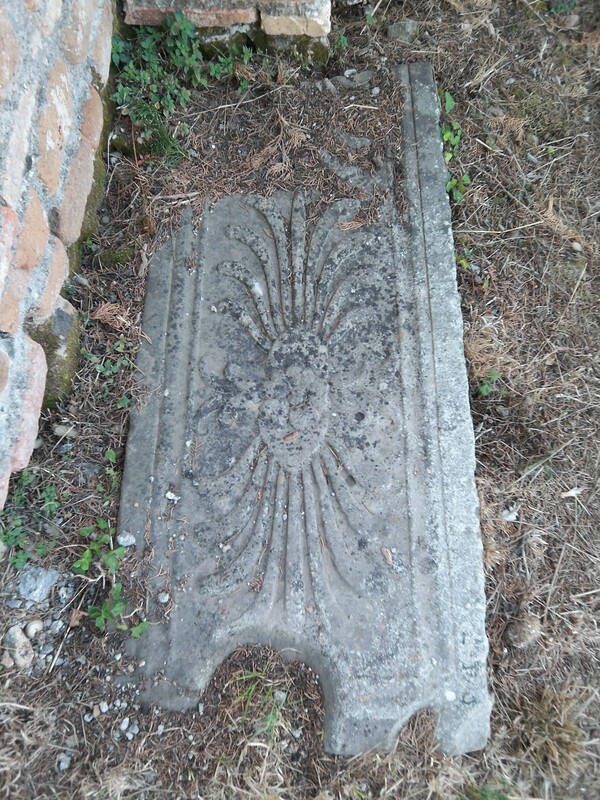 But we observed a tendency in some of our latest areas of the pavement, where we found an extraordinary high amount of reused architectural elements (spolia) with ornamental decoration. 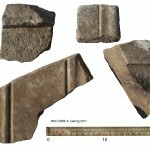 Apart from this newly found material, also large finds from the old excavations were included in this section, due to the fact that they were not documented and thus had no find-number. 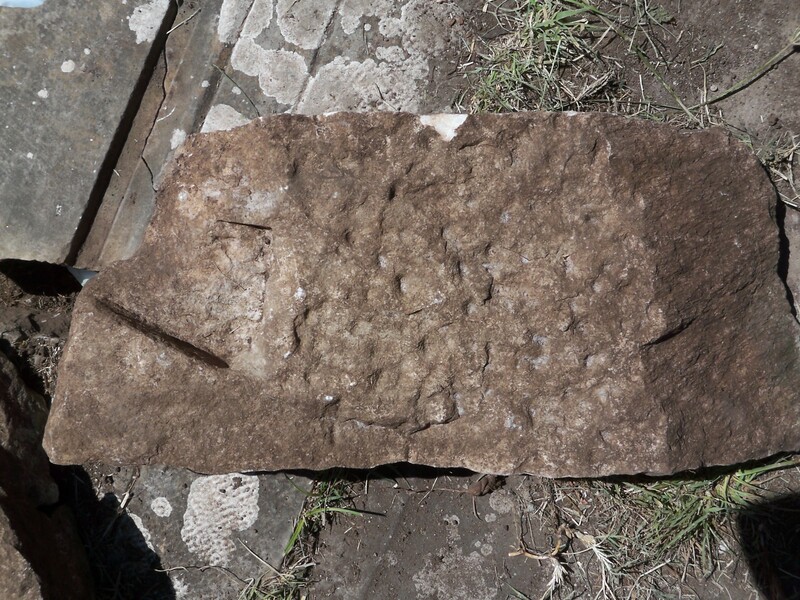 “Old” and new finds will be presented here commonly to show their possible significance for interpretation (see pictures below). 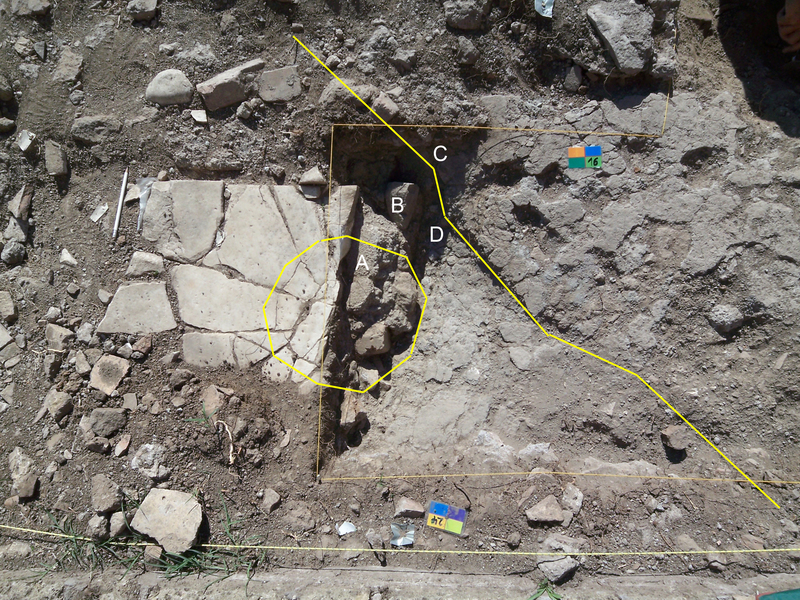 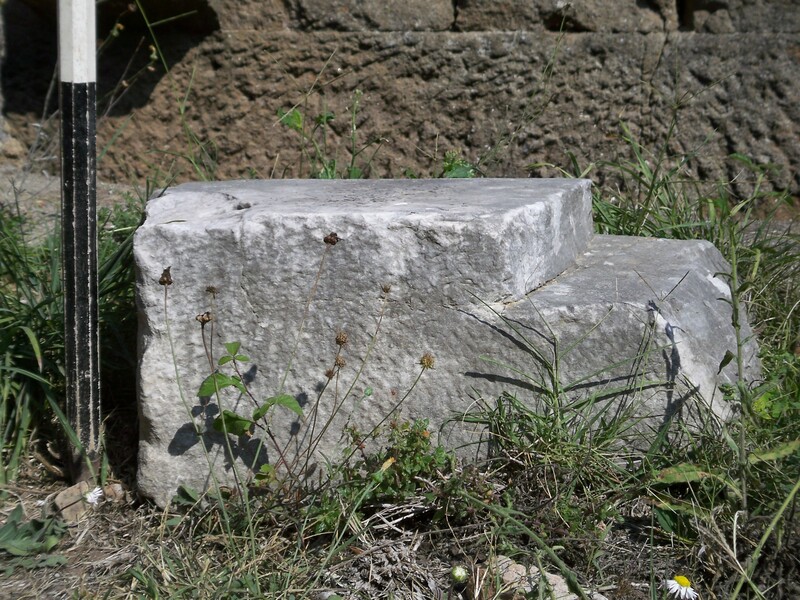 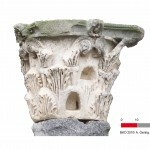 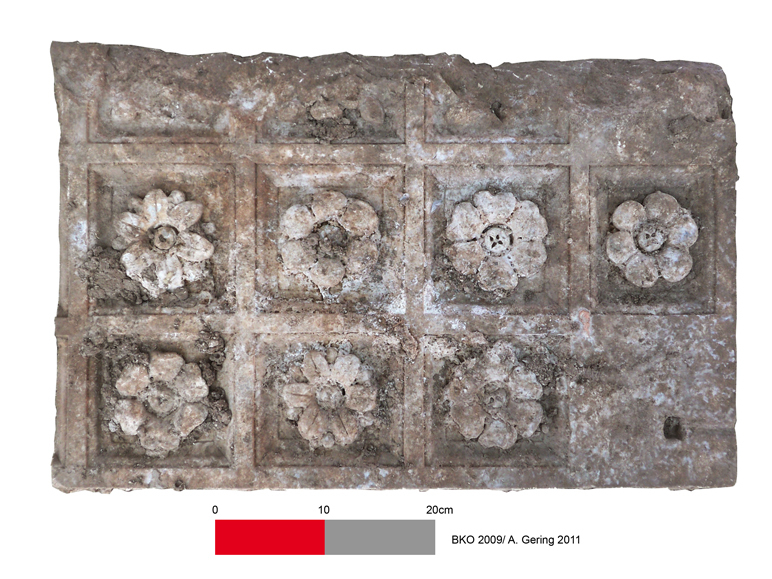 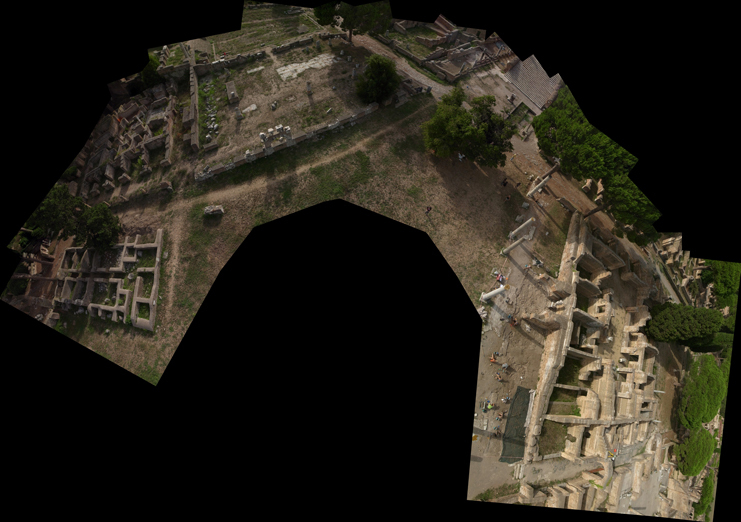 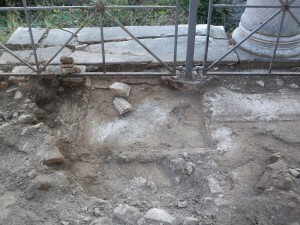 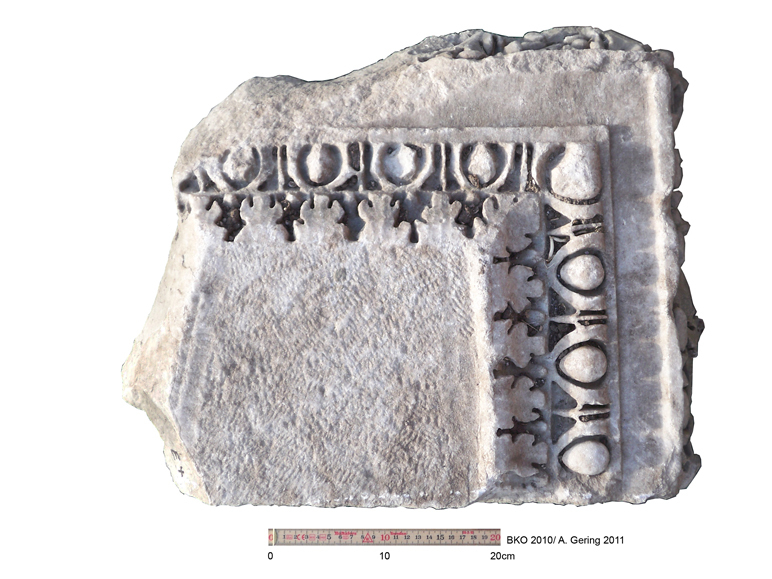 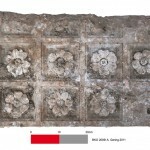 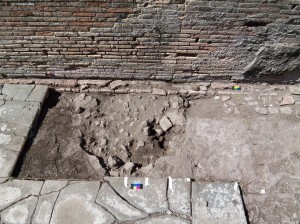 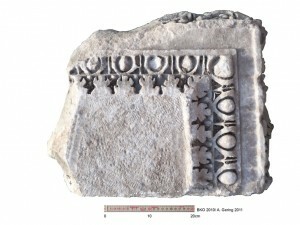 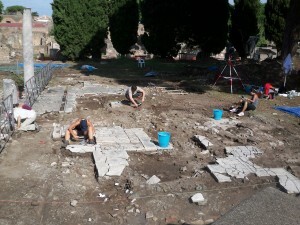 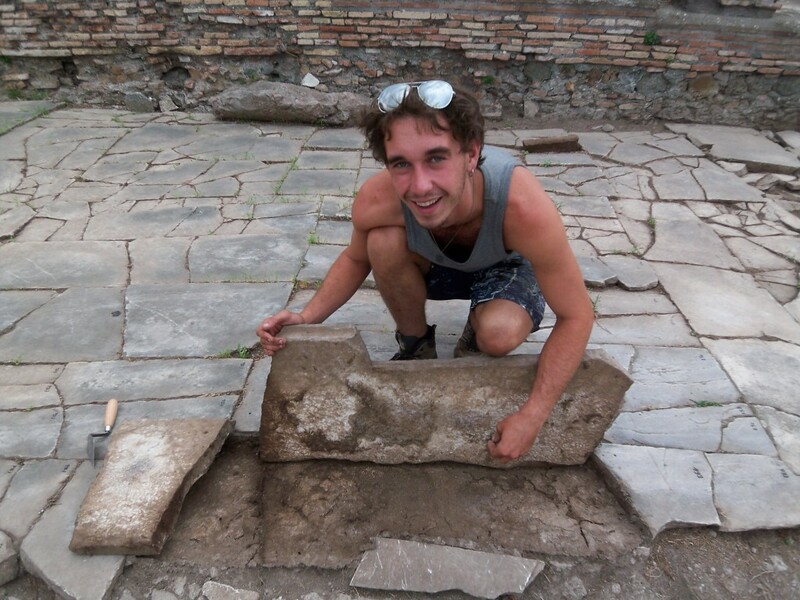 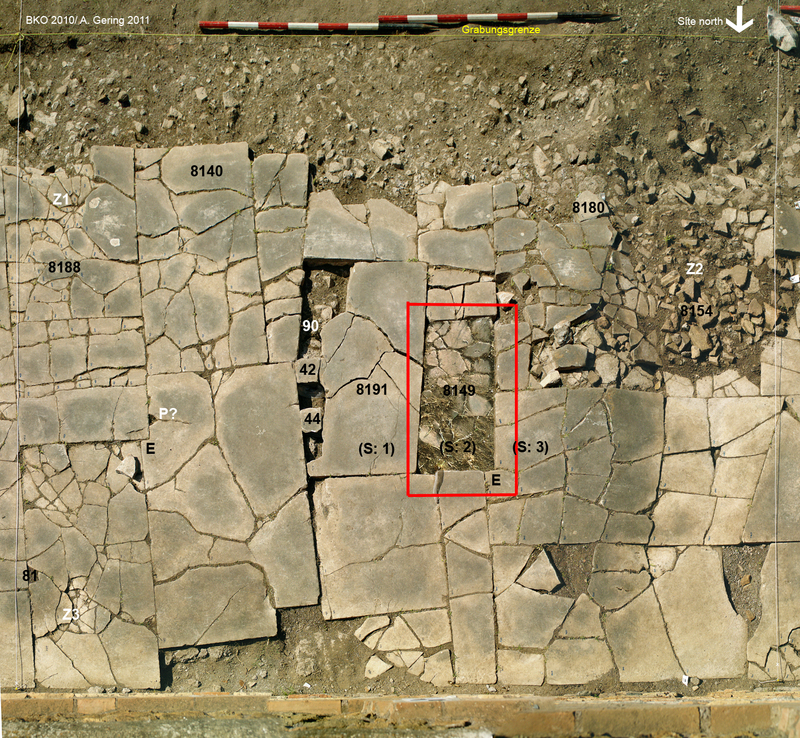 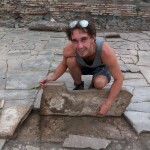 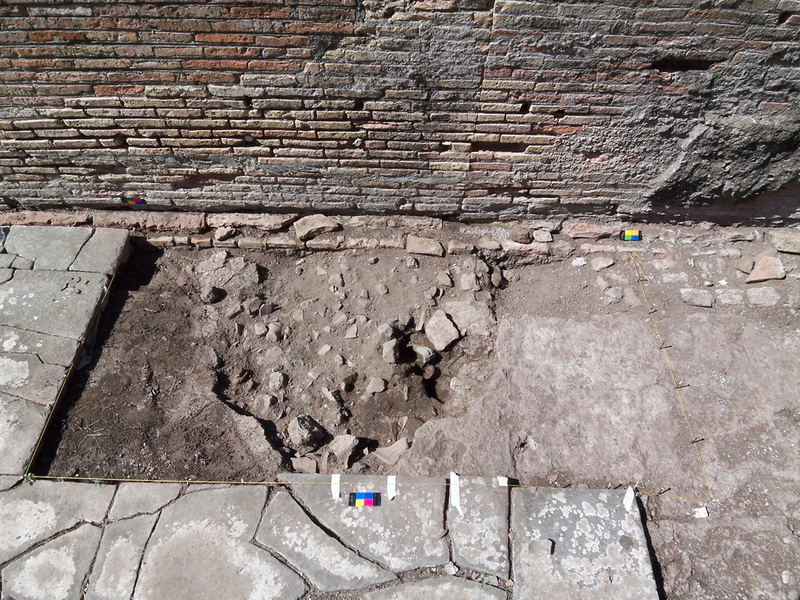 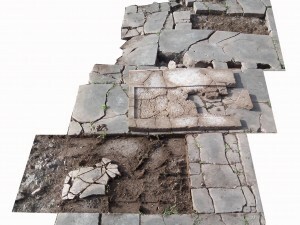 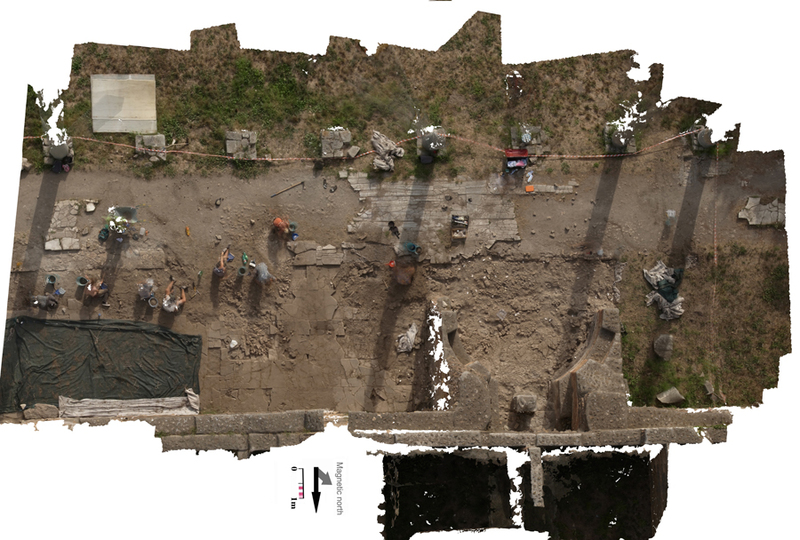 In the south part of the Forum, we found the highest amount of architectural elements with decoration in situ reused in the pavements (compare section “Spolia-Surveys“). More or less elaborated chisel-marks have destroyed parts of the ornamentation of an architectural element (see picture below). 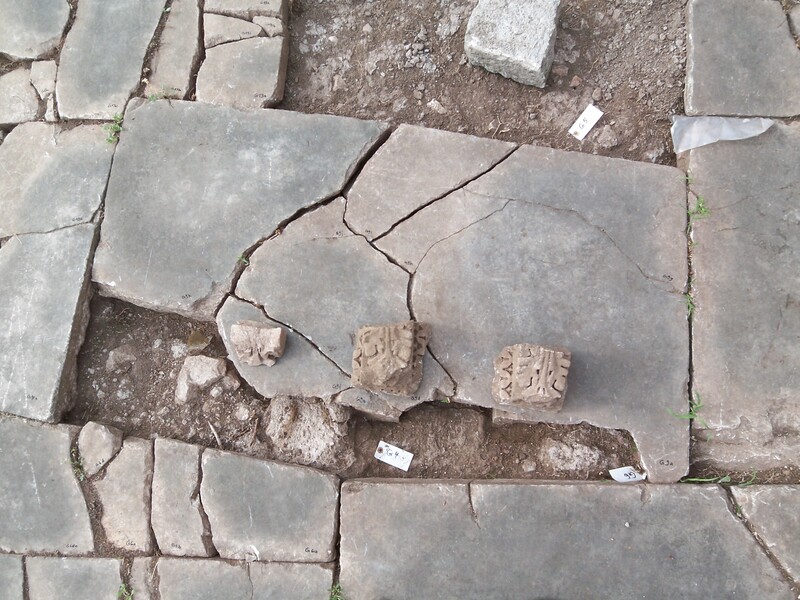 This demonstrates clearly that the chisel-marks were part of a secondary use, but not necessarily the last or third use, when the entire ornamental block had been cut to pieces to be reused as building-material or pavement-slabs. 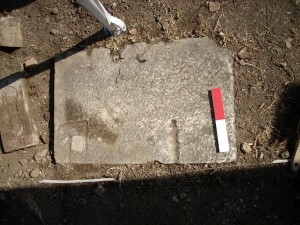 In some cases, the working-processes of the stones can clearly be defined as their primary use (see picture below), when the slab was embedded upside down in its new secondary context of use (see second picture below: context 8188). 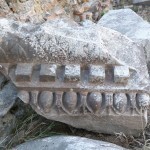 The same kind of reuse happened to an extremely heavy stone with ornaments (see pictures below). 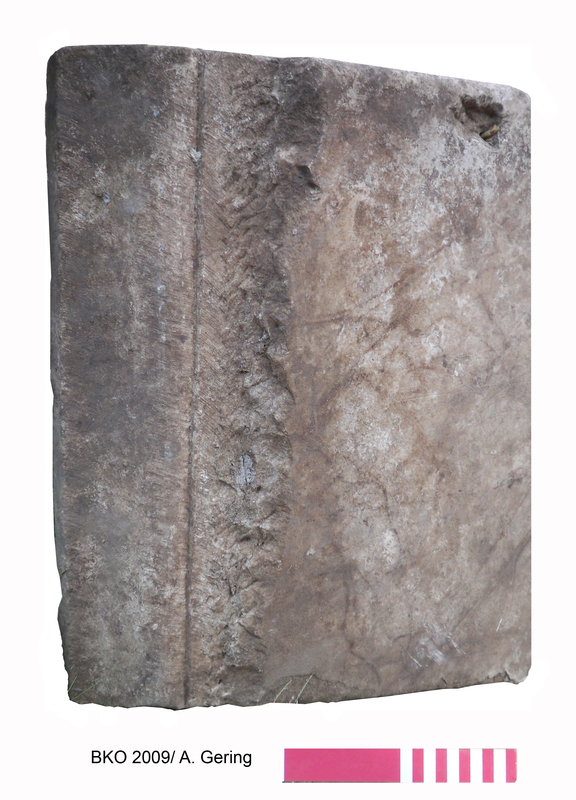 It was reused in the context 8191 (see picture above) without traces of later reworking, because all faces of the stone were polished intensively, an effort which would not have been done for a simple relaying of a stone into a mortarbedding. 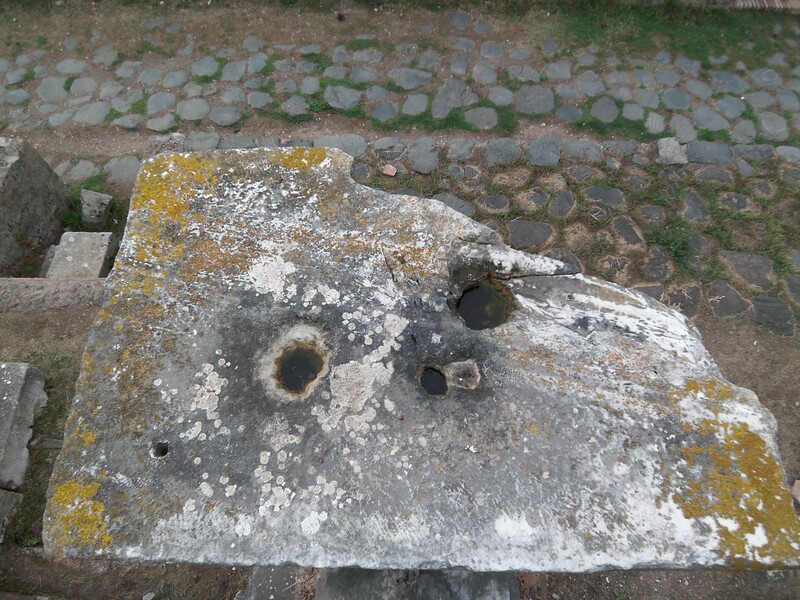 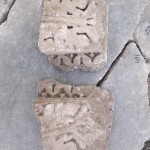 When we found this stone, parts of the architectural decoration were broken because of their fragile connection with the main block. 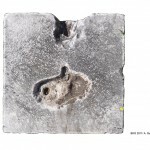 For the pictures below we have put them upside down on top of the stone-block, part of a “Konsolengebaelk”, which was measured and drawn completely in 2013. 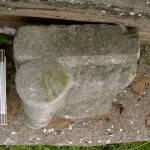 The polished backside of the massive stone-block can be verified by its imprint in the mortarbedding (see picture below). 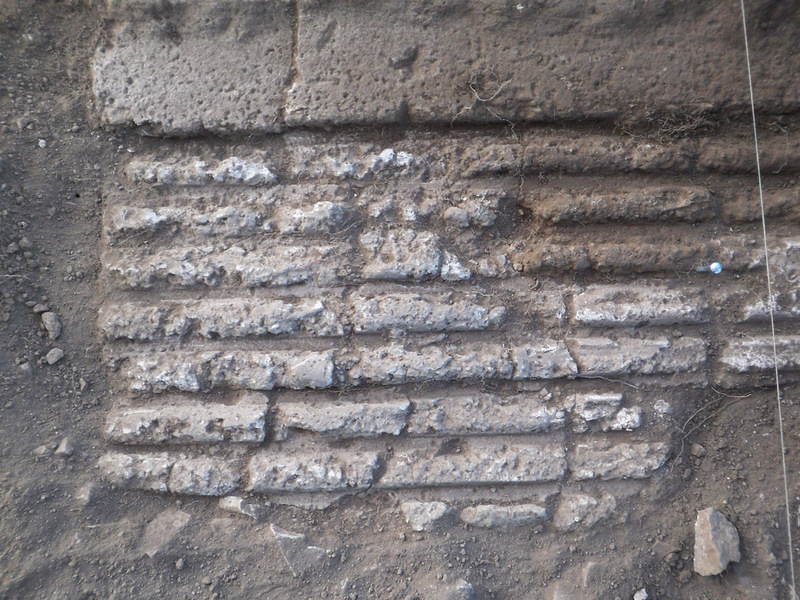 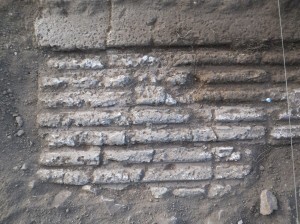 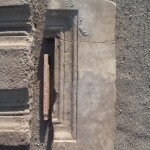 Traces of mortar inside the decoration (see picture below) are good evidence that the spolia below was embedded upside down in the former pavement of FSE. 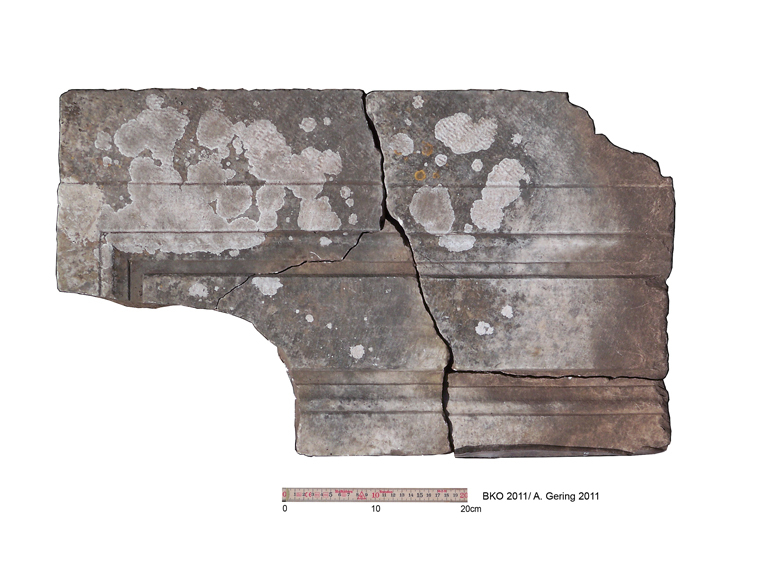 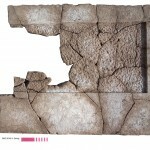 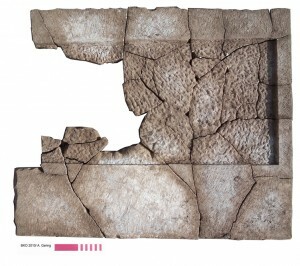 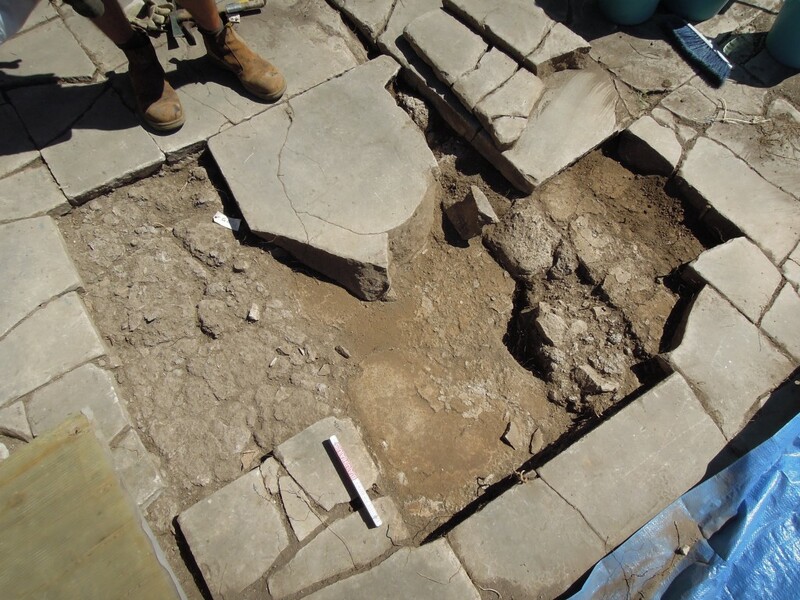 The backside of the decorated ceiling fragment was an ideal slab-surface even without further reworking necessary (see picture below left) in the attempt to make it fit to the other slabs of the late pavement of FSE (see picture below right). In its actual position there was no preserved mortarbedding beneath the slab, unfortunately. 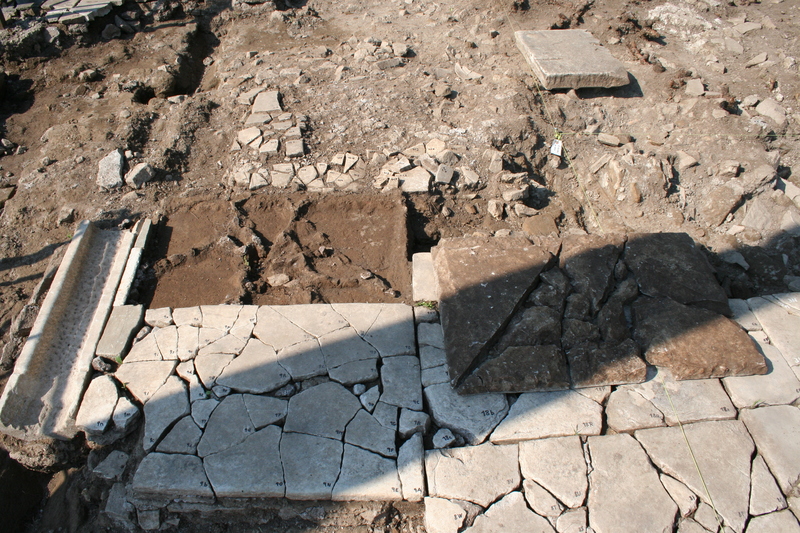 A similar embedding-technique was found in the latest parts of the Forum’s pavement: instead of a thick and solid mortar-bed, which would have been necessary when using thin slabs, the massive reused slabs (see picture below left) were laid directly on top of pre-existing structures with only a minimal mortar used, which obviously has dissolved (almost) completely, due to the several decades,where it has been exposed to surface-vegetation and erosion-processes (see picture below right) already before we could document the context scientifically. 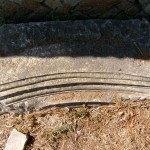 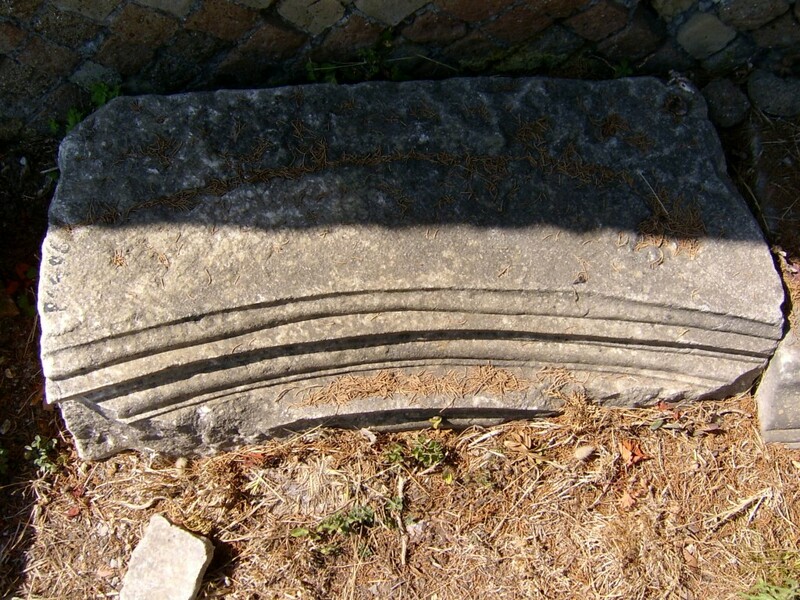 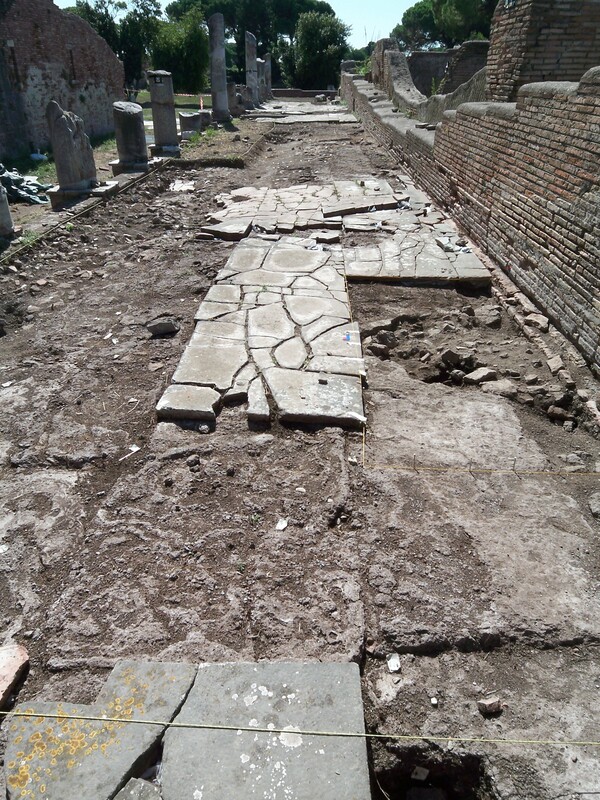 Spolia-fragments reused directly next to each other in the pavement were not necessarily from the same origin (see the non-matching examples below). 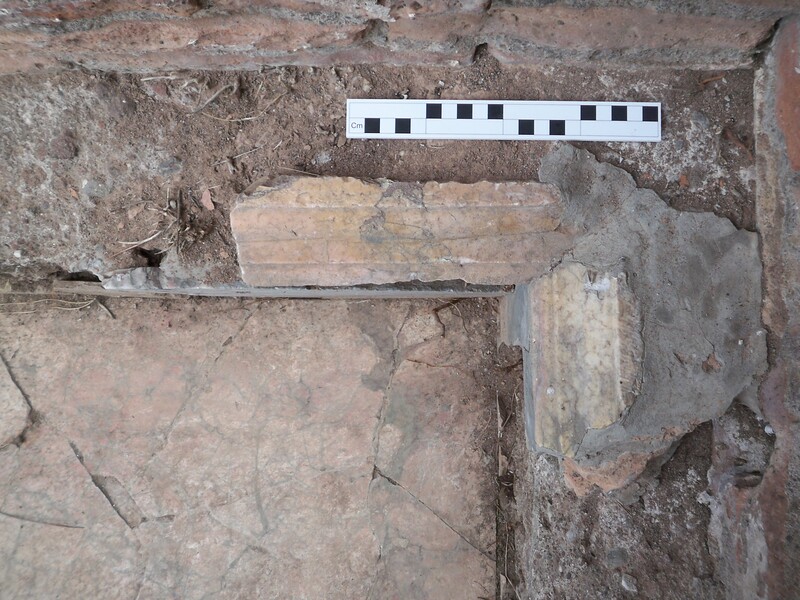 A more unusual way of a secondary use is visible in the picture below: the spolia was embedded with the decorated side up even though the underside was perfectly flat, which would have been ideal for its reuse as a pavement-slab. 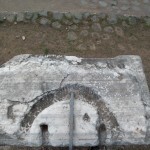 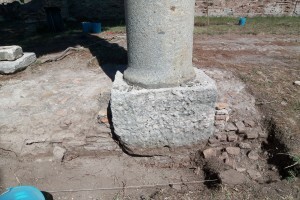 The spolia-slab (see picture above) was part of the latest mortarbed (see picture below) of the portico west of the Capitolium (MFW). 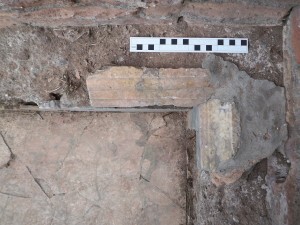 … but cavities in the underground, caused by this collapse, were filled again and sealed with a fragile layer of finer material immediately underneath the level of the former slabs, which were probably relayed again, but in an already broken condition like in FSE (see below). 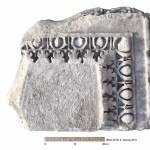 Due to finds of the most colorful wall-decoration in marble (see picture below) in situ, which means that it was buried in contexts of collapsed walls and ceilings, it is possible to reconstruct the wall-decoration systems of the porticoes of the Forum. 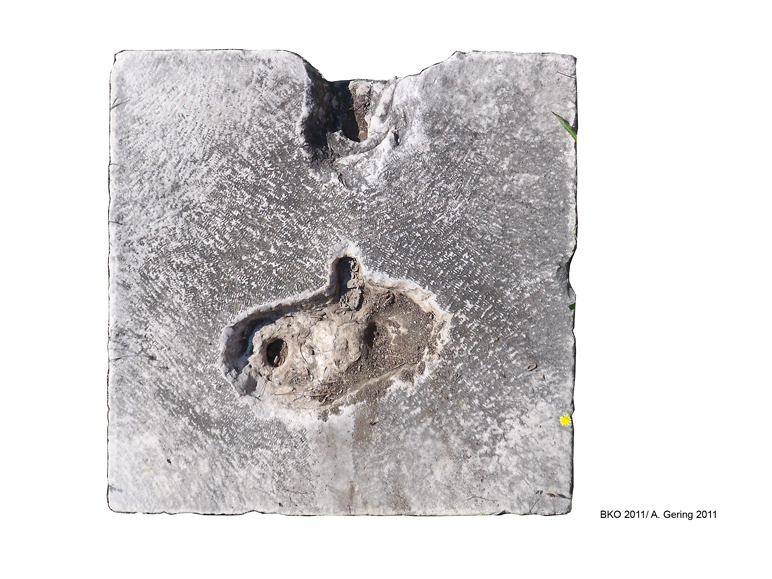 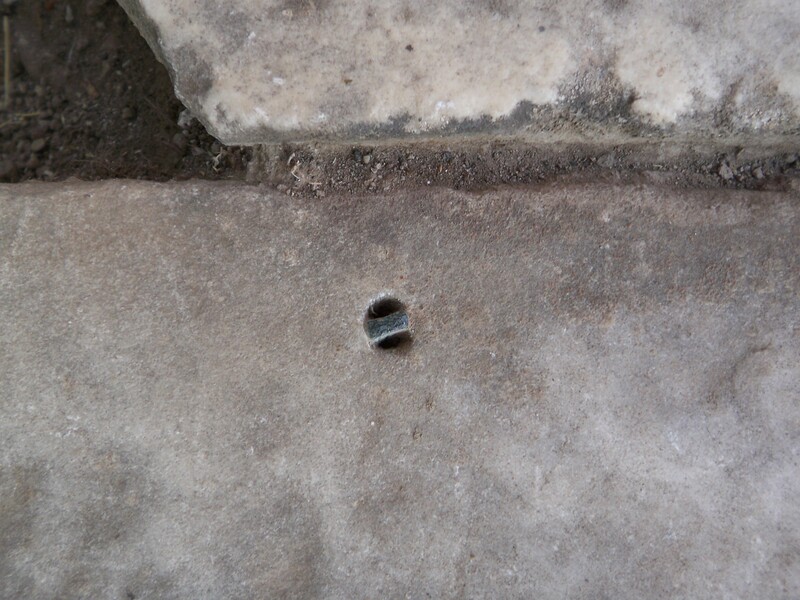 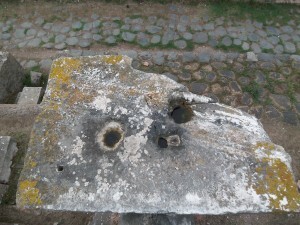 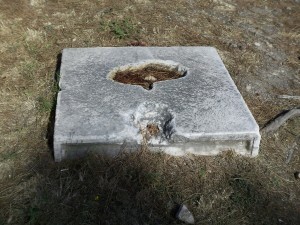 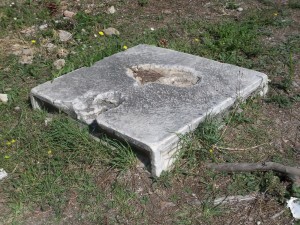 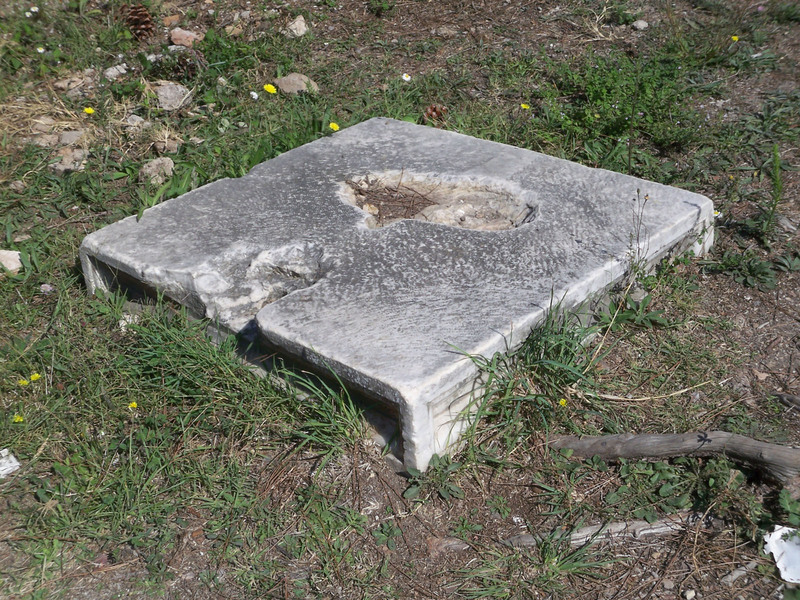 Traces of the first and original use of monuments, which were recycled later, are often minimal: in the picture below to the left the little bronze-nail embedded in the marble slab of a pavement shows that this element was a former wall decoration-slab which was ususally attached to a wall by such bronze-nails in the imperial times. 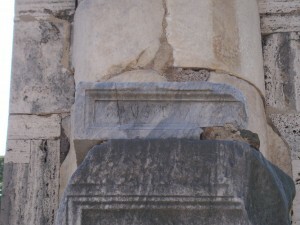 In the picture to the right the situation is reversed: the secondary use of these capitals is only visible according to their repairs of single leafs. 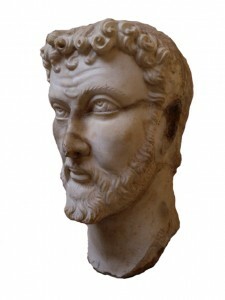 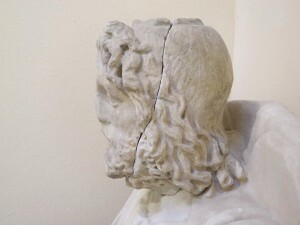 Minimal traces of the first and original use can be verified for prominent finds like the late-antique portrait-head from the old excavations around the area of FSE (see picture below left), which was already reworked from a head of a pagan god, Serapis (see picture to the right). 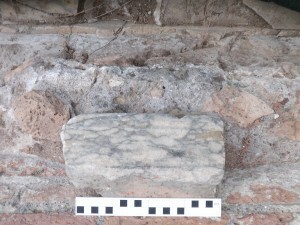 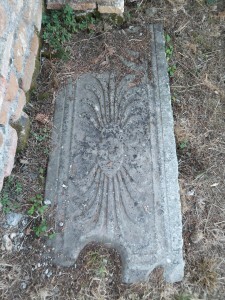 Some decorated spolia, which has disappeared due to robbing-activities, are only recorded by their imprint in the mortarbedding (see pictures below). Other spolia-finds are “out of context”, but archive-studies can still provide some idea of where they were found during the old excavations. 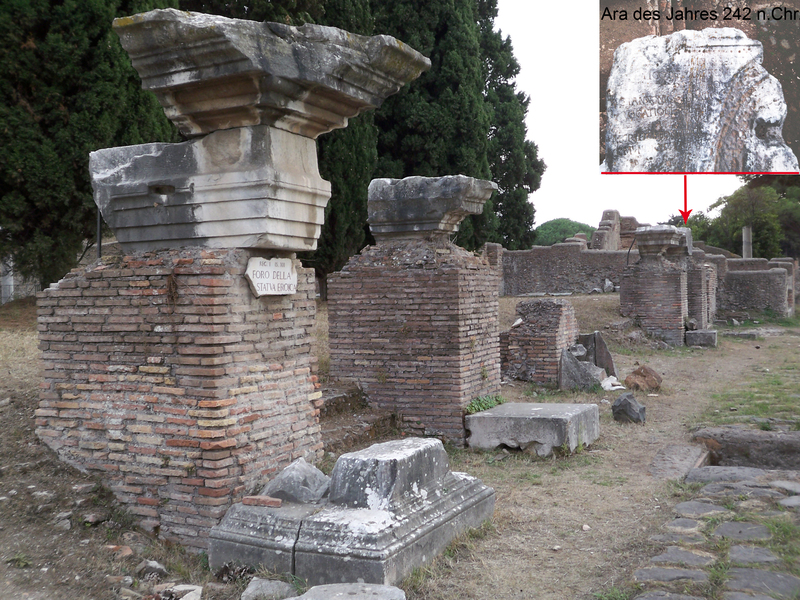 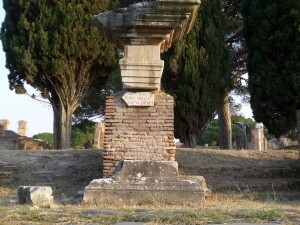 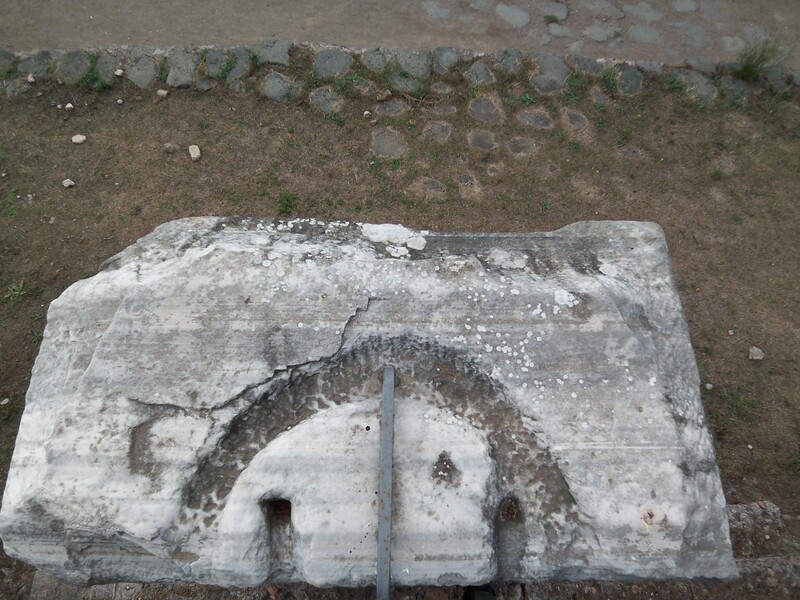 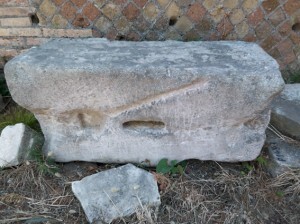 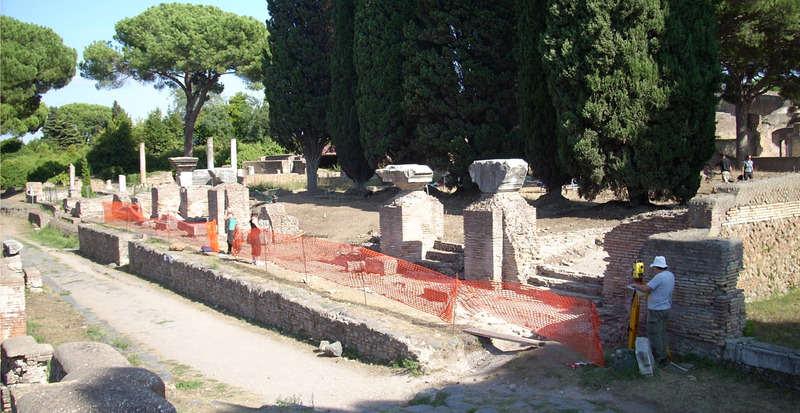 Close parallels to the reuse of bases for a possible late statue display can be found on the Forum Romanum in Rome itself: in front of the pillars and columns of the facade of the Basilica Iulia there were socles, which resemble to a type also found in the area of the Forumbaths in Ostia (see pictures below). Another phenomenon can be attested to the podia in front of the pillars of FSE with the architrave mentioned above: stairs of the first late-antique building phases (see picture below), which were already reworked from other monuments, were reused as simple fundament of a new construction – that means with a different function, where they could not have been seen. 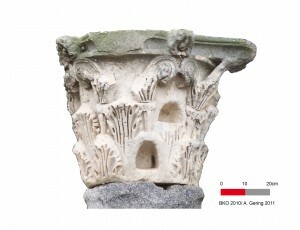 The same manner of reuse in an ‘invisible’ secondary context can be attested to the monumental socle of the cella of a big marble temple (see picture below). 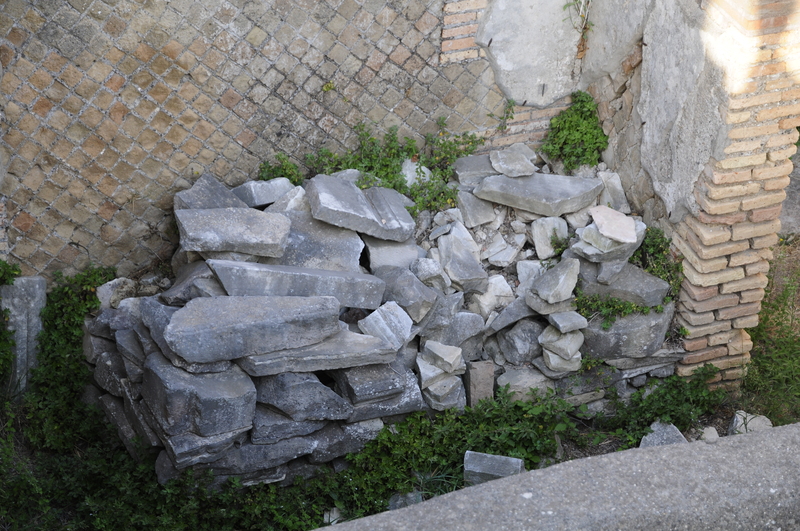 The fragments were dumped in a refill next to the inner colonnade of FSE. Because of their exceptional size and decoration it is rather unlikely that this dumping-process had happened during the old excavations in the 1930’ies (why undertake the big effort to transport something away from its original location, the Roma- and Augustus temple, just to bury it again?). 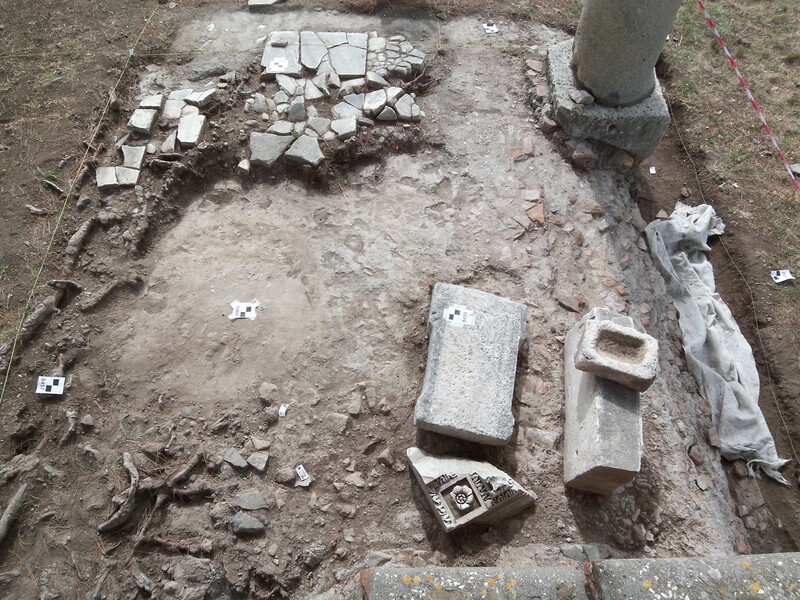 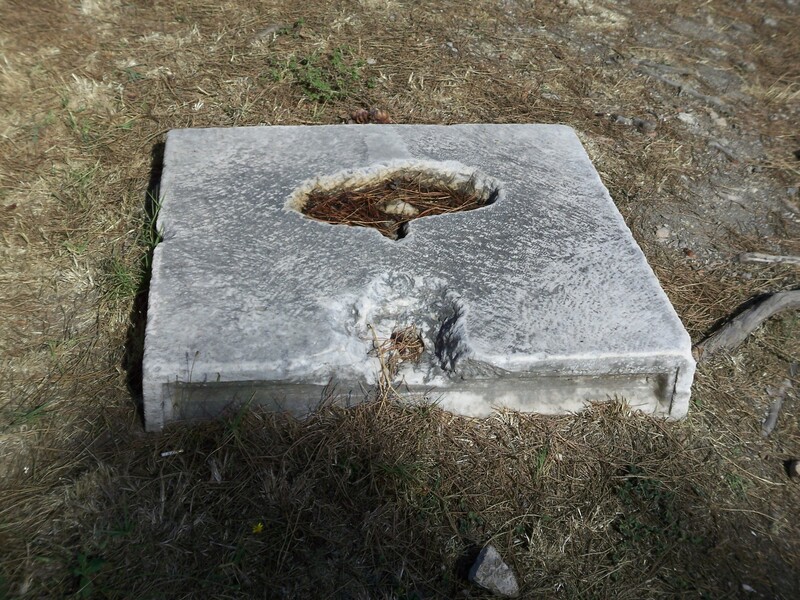 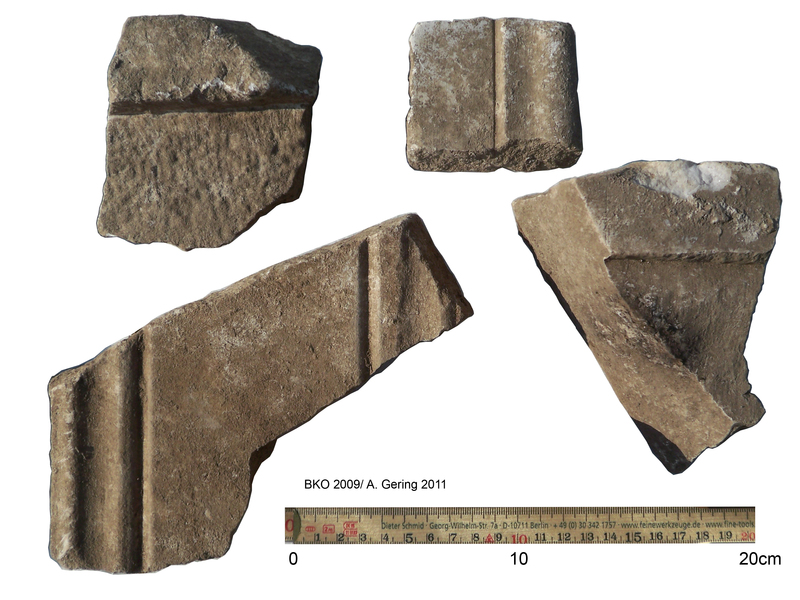 However, the refill-material has no more relevance for dating the secondary context of use of these architectural elements, because this material was removed and refilled again during the excavations before 1927 – a process, which is unfortunately not seldom in Ostia. 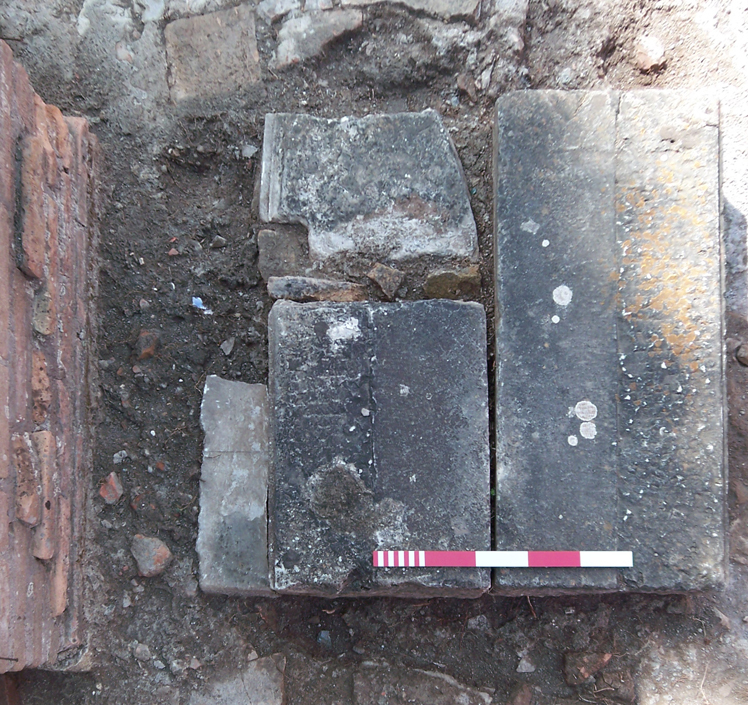 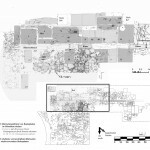 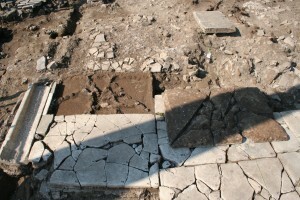 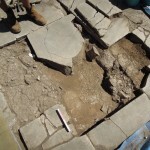 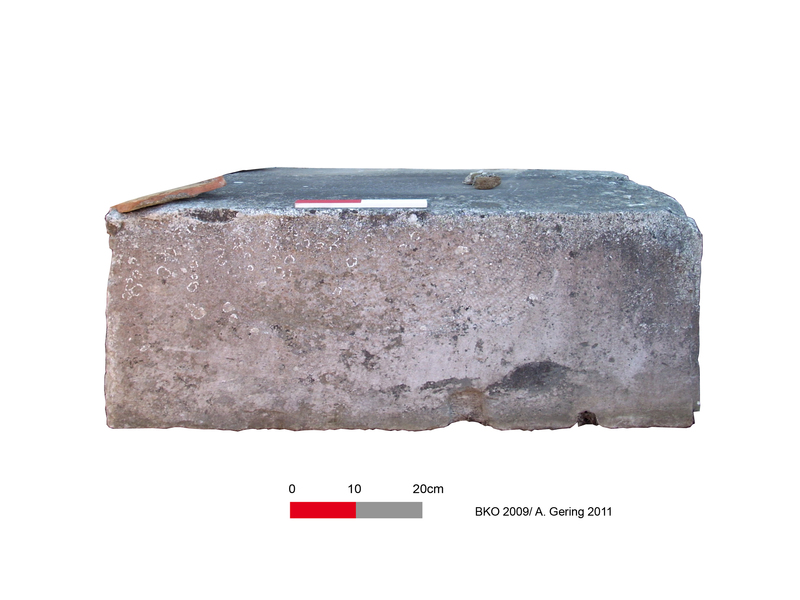 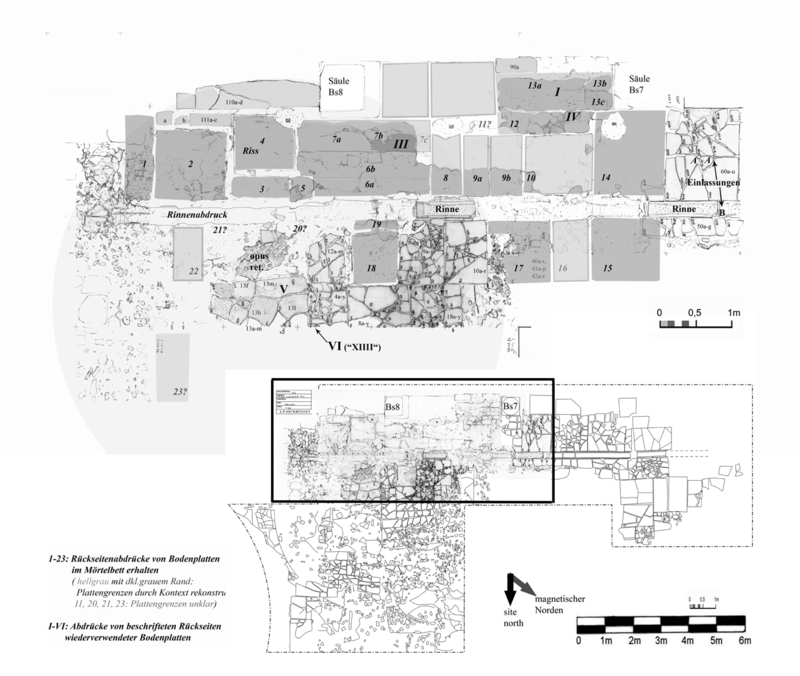 However, archive-studies of the documentation of the old excavations and supplementing excavations in 2008-2010 provide us with additional stratigraphical information, which is sufficient to verify that these blocks were buried after a collapse-catastrophe in a broken condition beneath a preparation-level for a later pavement. This occured obviously in a phase of a still monumental repair of FSE, and before stone-blocks like these would have been burned in a lime-kiln. 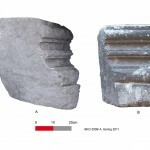 Another detail can verify these observations: the statue, which nowadays is re-located in the middle of the plaza FSE, was originally found in a similar stratigraphical situation used as a fundament fill for later column-stands, and this statue was similarly fragmented like the other architectural elements found in the fill (compare second picture below). 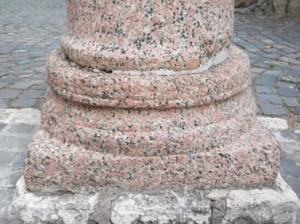 The function of an originally late antique refill with solid marble-fragments would have been possible to strengthen the immediate surrounding of the fundaments of the late columns, which themselves were built in a very improvised manner, probably in the middle of the 5th century. 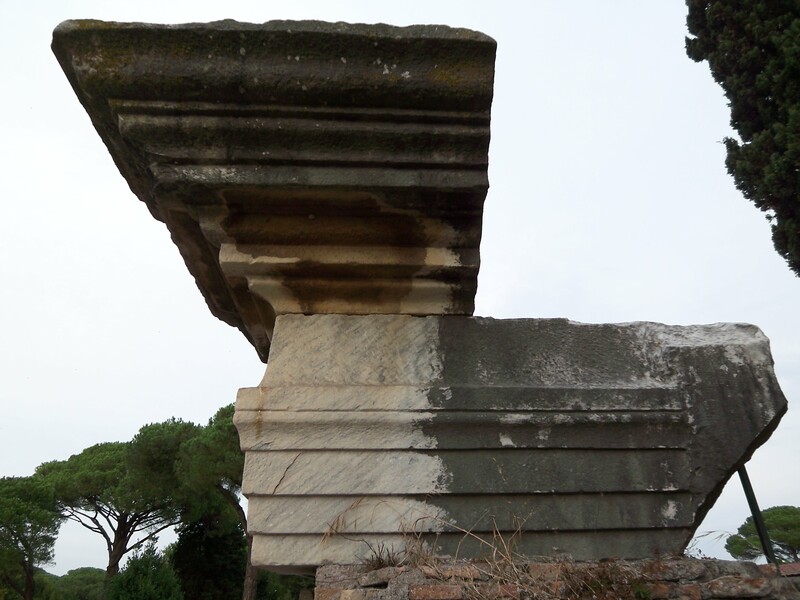 The context of the reuse of these socle-spolia is of a high importance for interpretation. 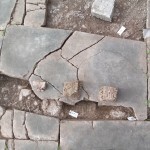 With the possibility to date the secondary use of these fragments, before the building-phase of the inner columns of FSE, we have a terminus ante quem for the final removal of one of the biggest temples on the Forum, the temple of Roma and Augustus (TRA). 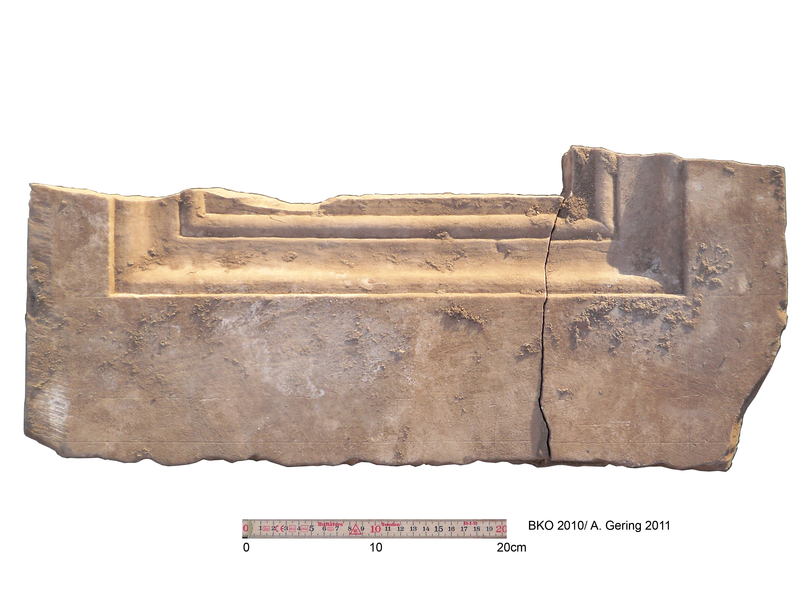 This has been part of an ongoing scientific debate regarding the end of this temple (compare Gering 2011 and Geremia Nucchi 2013). 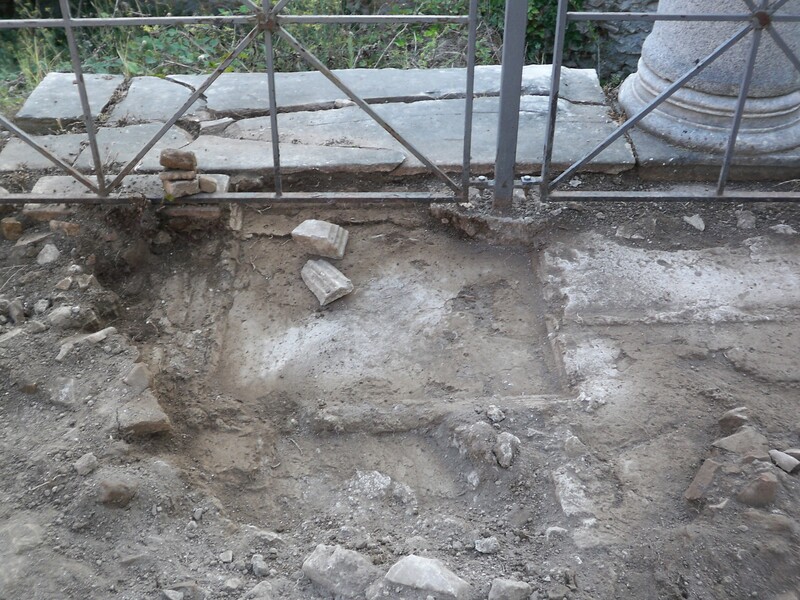 However, the process of discovering new spolia is not finished yet: every campaign bears new surprises (see picture below). 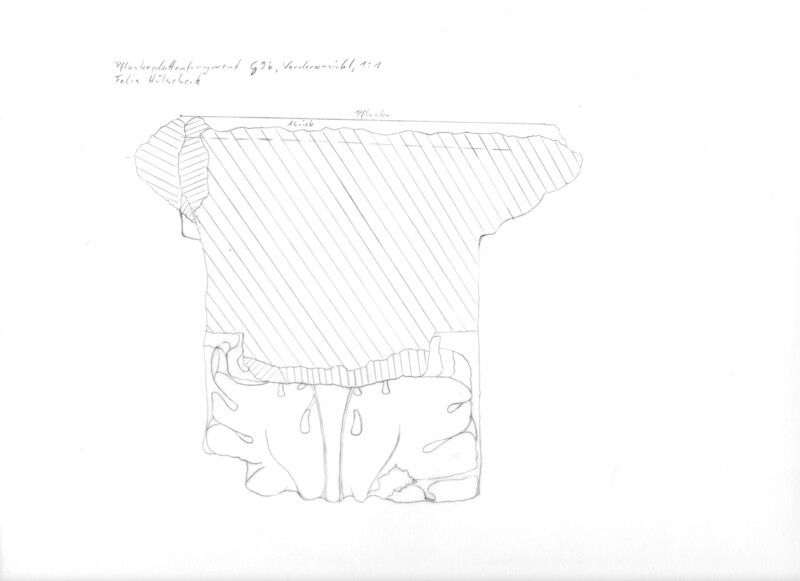 This section will be further updated soon!